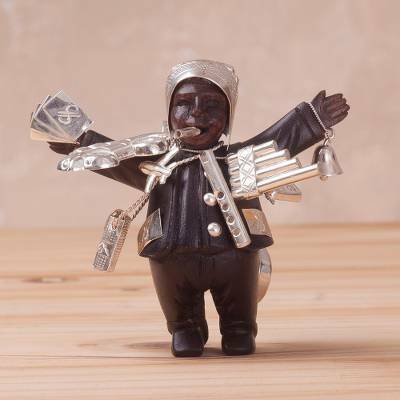 Sterling Silver and Mahogany Ekeko Sculpture from Peru, "Plateau Ekeko"
Peruvian duo Fernando and Janeth present this amazing sculpture that depicts Ekeko, a traditional Andean character said to bring abundance to the home or office where he is displayed. The short image is carved by hand of rich mahogany, standing with arms outstretched. His figure is laden with sterling silver charms that represent wealth and abundance, including a car, money, and musical instruments. "Our love and passion can be seen in every one of our designs." "We were born in Lima, known internationally as a center of culture and commerce. We look for the fun moments in life, and find a reason to smile no matter how adverse the situation. We are hardworking and responsible because our art requires much detail and patience. "We've faced complicated situations together, especially during a period of hyperinflation when price increases were out of control, At the same time, our currency suffered a devaluation. Our home — like that of all Peruvians — was greatly affected. We we bought only the most basics products and sacrificed a great deal during this economic crisis. "All this was only one of the many challenges we had to face, not just in our personal and family life, but also in our woodcarving. "While we were still very young, our parents began showing us how to select the wood and, little by little, we eventually mastered all the finer details of woodcarving. Janeth learned how to work with silver, using different techniques and creating different finishes. We've been developing our art ever since and always focused on our goals. We knew we wanted with all our hearts to create an art collection that combines our ingenuity, intelligence and — above all — our creativity. "We believe that hard work, consistency and perseverance achieve great results. Our parents inspired us in our work. Over time, we've developed and perfected our own style that maintains our family legacy. "We were born in a country with an ancient culture, and a great historical legacy. Peru is home to one of the Seven Wonders of the World. We are so proud of our homeland and want to share our culture through our art. "It's wonderful giving a free rein to our creativity. Developing complex and fine wooden sculptures can be challenging. In addition to carving with precision, we also study anatomy, shapes and proportions as well as perfecting our silver work to create incredible details. Our love and passion can be seen in every one of our designs. "Our inspiration comes from Peru's great history and culture, and our sculptures convey our traditions, religion, and the details of our daily lives. We believe we're capable of doing everything we set out to do."